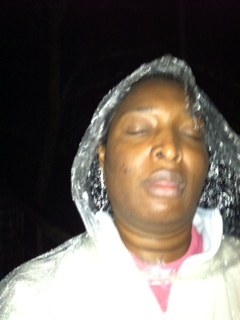 Lawd, I hate nature – or rather I hate being outside IN it in the dark and rain. 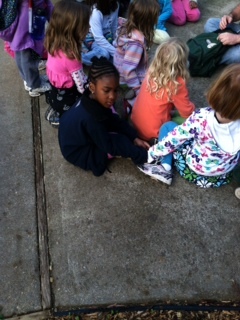 This weekend the girls’ Daisy troop had a mother-daughter weekend camping trip at the Chattahoochee Nature Center. Several of the Daisy troops in the area attended as well, and in all there were about 60 little giggling girls scampering around the building at any given time. Our all Black troop must have been an oddity. As we set up “camp” by laying our sleeping bags on the carpeted concrete floor, the girls from the other troops peeked into our room, assessed us for a few seconds, and ran off laughing hysterically. They did this several times until one of their parents told them to come back into their rooms and settle down. I didn’t mind, personally. I thought it would be a good ice breaker. After all, we would be sharing time and space together for the next 18 hours or so. I passed other mothers in the hallway, trying to get their green, brown and blue eyes to meet mine so that I could nod and acknowledge their presence or offer a nonverbal greeting. Their eyes remained firmly fixed on the floor or looking just past me, as though I were a phantom in the aisle and not really there. The ice, therefore, remained firmly unbroken. The Girl Scout event promised to be a fun one none-the-less. We went on a night hike (in the rain) to look for nocturnal creatures using four of our five senses. It was decided that it would not be in anyone’s best interest to try and taste a nocturnal animal. We were utterly disappointed when it became apparent that we were the only woodland creatures foolish enough to be scurrying about in the drizzle. However, I did hear a wayward goose calling out in the darkness. Our line leader managed to keep the event interesting, pulling possum pellets and owl wings from her purse and letting the girls sniff various odors from the very pleasant (like cinnamon) to the not so pleasant (like skunk musk). Damp and tired, but invigorated by the prospect of getting some s’mores, we trudged back to the main building where a roaring fire was waiting for us. Each girl was given their marshmallow by the month they were born in, and after each treat was roasted, I looked around for an opportunity to join a different group of moms’ in conversation. After all, was that not the point of coming to a Scout event: To “make new friends”? As a former Girl Guide myself, perhaps my judgment was clouded, but I expected that as adults we would demonstrate courtesy and how to conduct ourselves amongst strangers, by at least offering an introduction or acknowledging the presence of strangers who may be unknown to us, but still part of the same organization. Surely, these are women and girls who share our same ideals? Their turned backs in our direction said otherwise. Had it not been for our Den Mother’s insistence on singing campfire songs, I daresay there would be no spirit of camaraderie exhibited at all. The irony that were doing the very opposite of the refrain make new friends/but keep the old/ one is silver and the other gold did not escape me. Still, it was nice to have some meager manifestation of my romantic notions of what a Girl Scout camping trip ought to look like become a reality. 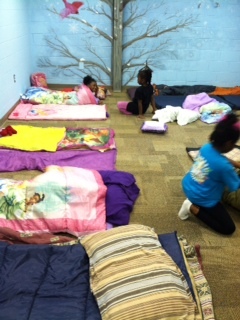 After a long night of telling “ghost stories”, and eating left over GS cookies and snacks, we informed our protesting girls that it was time to go to bed. “There’s a movie playing tonight,” I informed them. I never said the words “go to sleep”, but within minutes, their gentle snoring filled the room. I hardly slept a wink, of course. Aya had taken my pillow and I don’t do well on the floor. I would have preferred to stay awake, but I was exhausted after having worked the morning before. I passed the night doing a series of motions that mixed sumo wrestling and napping. I was grateful when the rising sun ended my ordeal. I woke my girls fairly early and took Aya to brush her teeth. Cheryl, our den mother was already up, eating breakfast and forwarding pictures from all of our endeavors so far. I smiled and said good morning to her, which of course she did in return. We were the only people in the bathroom with a few other moms and daughters filed in. Maybe it’s a function of my upbringing, but I thought it was common practice to greet someone when you walk into a room. We remained ungreeted and unacknowledged until one of the mom’s asked me if the sink she was standing in front of was working. “I don’t know, but you can use this one as soon as soon as we’re done,” I offered. She grunted and waited for us to finish. Maybe she just wasn’t a morning person. I tried to find some common ground in one of the other mothers who looked like she was of mixed Asian descent. “How did you sleep last night?” I asked, knowing that the night had to have been rough. It was cold and the floor was hard. The answer was a no brainer, and the question was meant to break this wall that was dividing us, or put a chip in it at least. She remained silent, again not looking at me. Finally, her kindergartener spoke up. “Horrible. It was horrible!” she cried. With no further invitation to continue any conversation, I went to get my coffee. At this point, I was done with all these mothers and done with the event. These women had proven themselves, rude, excluding and frigid. My disdain for them was only heightened when I heard a group of them conversing outside about what a “blessing” it was for someone to have organized an event at their church and how “fortunate” they were about how it was “impacting” their youth. I quickly picked up on their Christianese dialect, which only served to disgust me further. What Christ do you serve that compels you to be so dismissive of your neighbor? Does your Jesus command you slight another group of women because they look different from you? What brand of “godliness” is this? Because whatever they were serving up, I wanted no part of. Today marks one month since Trayvon Martin’s murder, a crime that has me more conscious of race than I have been in a long time, and I know that I am not alone. It has brought the subject back to the forefront for us as a nation: Black and White, Jew and Hispanic. There are certain ambiguities surrounding Trayvon’s case, but one thing is glaringly clear: the root of this tragedy lies in prejudice, suspicion and mistrust. I am not calling any of these women racist – not by any means. After all, I don’t know them. But judging from their actions, I believe I can safely conclude that they did not believe that neither I nor any member of our all Black troop was worth getting to know. And is that not at the heart of all prejudice? Judging someone’s worth before you form a relationship with them? All hope is not lost though. Just before we left for our hike, Aya made a new buddy. The little strawberry blond called out to her mother as they sat on the ground clasping hands. “Mommy! We have something in common!” she said excitedly. “You must both like blue,” her mother said knowingly. The two girls nodded enthusiastically and grinned. Her mother and I shared sheepish smiles and turned our attention back to the naturalist, who was giving instructions on our impending morning hike. The event, though short gave me much food for thought. As I said, race is in the forefront of my mind, but it doesn’t direct my life. I am racially conscious, but not racially controlled. In the wake of Trayvon’s murder, I am reminded of the bevy of inner city outreaches and gang rehabilitation programs that exist in our nation. Has there ever been a suburban outreach program for Whites to help them get over their fear of Black kids in hoodies? I can’t think of one. I would have hoped that a godly organization like the Scouts would have served that purpose, but there seems to be an obviously failure in my thinking in that regard. Maybe I’m wrong. Maybe in my kids’ generation, it and other organizations like it CAN be.